Lencrow has just released its second generation pedestrian reach stacker. The first series has been in operation in Australian work places for over twelve months and with the feed back from operators we have decided to go back to the drawing board and add some improvements that will offer improvements to operator safety and the ergonomic operation. 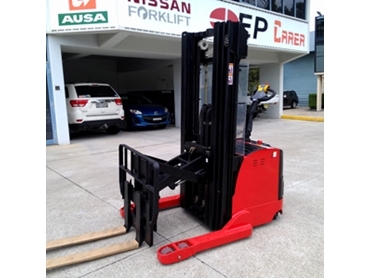 The stacker is designed to be used in small to medium business and only requires the operator to be instructed in the operation and safe use of the equipment and requires no operator licensing. The improvements include proportionate hydraulics for lift and reach as well as a new more ergonomic handle. Other features include safety rubber bumper for operator safety. Other features were to improve reliability and make the units easy to maintain. The unit’s AC operation offers long duty cycles between charging batteries which in turn gives these units a very good carbon footprint. Charging has been improved with the use of automatic charges that gauge the battery condition while charging and with the addition of single point watering with water gun battery maintenance is made easy. The unit is available in lift heights to 5500mm and with two capacities 1500kgs and 2000kg making it the ideal solution for many operations. These units include power steering and side shift in the price so you will get the complete package.